Darlys Kuschel, age 84, of Browns Valley, MN, died on Friday, November 30, 2018, at the Browns Valley Health Center, Browns Valley, MN. Services will be held on Monday, December 3, 2018, at 10:30 a.m. at Zion Lutheran Church in Browns Valley. Visitation will be held on Sunday, December 2, from 5:00 to 7:00 p.m. at the church, with a prayer service at 7:00 p.m. Rev. Larry Johnson will officiate, and burial will at Valley View Cemetery. Darlys Darlene Kuschel was born to Agnes (Oletzke) and Fred Labs on July 31, 1934, at home in Browns Valley, MN. She was baptized and confirmed at Zion Lutheran Church. Darlys grew up in Browns Valley. At the age of 14, her family moved a few miles outside of town to Pleasure Park, more commonly known as Ike’s Chicken Shack. Shortly after, they relocated to Fernsley Beach where they hosted many tourists and summer vacationers at Traverse Resort. She lived at the family resort until 1952, when she graduated from Browns Valley High School. In 1951, she began working at Union State Bank and continued to work there until 1954, when she married the love of her life, Edwin Kuschel. They were united in marriage on June 5, 1954, at Zion Lutheran Church and the two made their home and started their family on their farm in Roberts County, South Dakota. While raising their seven children, Darlys served on the church council, Centennial Committee and Zion Lutheran Altar Guild. 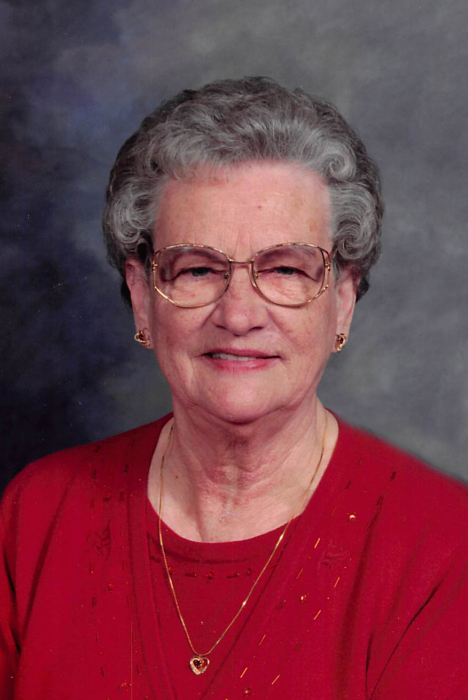 She was a member of Lakeside Mixers, president of the band mothers, served on the alumni committee and was president of the Browns Valley Alumni Association. Together, she and Edwin enjoyed hunting, fishing, camping, spending time in the family garden and playing Canasta. As their family grew up, they could be found cheering them on at football, basketball and volleyball games, wrestling matches, and band and choir events. Darlys also worked part-time at Paulson’s Grocery Store while their kids were in school. Her hobbies included reaping the rewards of their garden, baking, and embroidering. She and Edwin especially enjoyed watching their grandchildren sled down the Kuschel Hill and hosting holidays, even when the farmhouse became so full of family and there wasn’t enough floor space to find a seat. They passed along many traditions to her family including always having a warm pot of oyster stew at the family’s Christmas gatherings. Darlys and Edwin spent their entire married life on the family farm until Edwin moved to the Browns Valley Health Center in October of 2009. Darlys joined him there in August of 2010. Darlys is survived by one son, David (Lori) Kuschel of Browns Valley, MN; six daughters: Diane (Jerry) Johnson of Browns Valley, MN; Patsy Serocki of Browns Valley, MN; Karen (Bob) Metz of Peever, SD; Dixie (Jeff) Sander of Devils Lake, ND; Sara (Greg) Wohlers of Montevideo, MN; and Kristi (Ed) Ahlbrecht of Litchfield, MN; 19 grandchildren; two step-grandchildren; 35 great-grandchildren; one step-great-grandchild; two great-great-grandchildren; and four sisters-in-law: Marlene Labs, Betti Labs, Ruth Bartz, and Jean Kuschel. Darlys was preceded in death by her parents; husband, Edwin; brothers: Duane and Eugene Labs; two granddaughters: Heidi Serocki and Megan Kuschel; son-in-law, Joe Serocki; and brothers-in-law and sisters-in-law: Orval Kuschel, Roger (Gladys) Kuschel, Arvin Bartz, and Evelyn (Harold) Boseth.